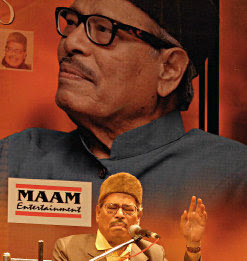 Legendary playback singer Manna Dey turned 90 years on 1st May 2009. He promised on his birthday for a live concert. It was organized on 10th May. Due to Internet checking, the show was late so ended also late. Here is the event report. For all the international readers of this blog, I have translated few songs lyrics in English. First one gentleman came for some formalities. He is the same one who used to participated in Shabd Kavi Samlen. He started with "Aavaj Jaise...Unki AAvaj hi unki pahechan hai..." Short biography of Manna Dey. Kolkutta to Mumbai and now Bangalore. Later on he informed us yes, out of 2 daughters one is settled at abroad so he is with his second daughter at Bangalore. 24th December 2008, the university also awarded him doctor of literature. He is 90 years old young man. We heard about 60 years old man, but this is first time. 3. Anari "Voh Chaand Khila"
Finally Manna Dey arrives. We all offered him standing respect. "Good Evning Ladies and Genetlemen" A fully confident voice, addressed us. At the age of 90 also, he was really a young man. Like Jagjit sing and all other singers, he instructed to adjust bass and treble. Then he thanked us for listening to Archna. He declared that first half, he will sing the song as per his choice. He wanted to check how is his throat today! 1. This song written by Madhukar Rajasthani. He wrote songs for Lata, Aasha, Mukesh, Talat etc. many singer. Unfortunately he is no more with us now. is about peackok dancing in rain season. He asked for tea, that had already arrived. So keyboard player offered him from chair next to him. 2. Meri Bibi Mumtaj Thi. A husband lost his wife Mumtaj at night time at the bank of Jamuna River. 4. Lyricist by Sakil, Music by Naushad and it has some influence of Uttar Pradesh (UP) folk music. The mindis scared now, about difficult task (of self realization) in limited time. The time is going on and so age is reducing. The song with spiritual meaning. सूर ना सजे क्या गावू मैं? 6. one more song written by Madhukar Rajasthani. Raag Thumari. A description of a crying girl. Her ornaments for nose, is broken and a pearl is missing from it. This song is between an old couple, who reconfirmed that we both are still young and good looking. 9. Next he called Archana to sing duet songs along with him. He took the tea cup from the chair. Archana bow down for blessings. He asked her choice then suggested to sing this song. A description of full moon night. A nice melodious song. You are like moon of the sky and I am just dust of the earth. जोड़ी हमारी जमे ना कैसे जानी ? A good fast song, reflecting the feelings of era, when people started traveling to abroad. It explore the possibility of marriage between foriegn returned man with a typical Indian woman. Mr. K. C. Khurana cracked a good joke. Once, a dying wife asked her husband about his plan after her death. He replied, "I will become mad." So she felt releaf that thank God, he has no plan to marry again. He told, "Well, a mad man can do anything"
This song was about a stange story where no one knows its niether beginning nor end. Manna Dey came back. He is born Bengali. So off course he wanted to sing few Bengali songs. He has diary that contains about 2500 Bengali songs, with all flavors like Thumari, Dhrupad, Khayal. His wife is from Kerala. So he sang one Malayam song (from "Chemmeen") and two Bengali songs. 16. coming back to Hindi song. A philosophical song, that describe life as a puzzle that make us laugh sometimes and sometime cry. 17. Dr. Harivanshray Bachchan, father of Amitabh and garand father of Abhishek. He wrote a nice epic Madhushala. Madhusala means liquer bar. Manna Dey informed us it is a gems in poetry and if he sang the full Madhushala then it will take one hour. So he recited few selected lines. 18. If Jagjit Sing concert can not end without "Yeh Daulat Bhi Le Lo...", Pankaj Udhas "Chiththi Aai Hai..." and Manhar Udhas "Shaant Zarukhe..." Same way, how Manna Dey concert is complete without his signature song. Yes. He started "Haaye Rama..." Then confessed "Wrong, wrong wrong.." And then that evergreen AALAAP from evergreen song. Laga Chunari Me Daag from movie "Dil Hi To Hai"
चुनरी में दाग छुपावु कैसे? This song is about a married girl, who is concern about spot in her dress। She is returning back to visit her parents home and she is worrying about how to inform that dress is spoiled to her father. जाके बाबुल से नजरे मिलावु कैसे ? It has deep spiritual meaning. We all souls are like that girl. We gave so many promises to the almighty before coming to this planet earth. However, here we forgot everything and lost ourselves in this worldly matters. Now, we have to return back as pure, divine, spotless soul. This song has nice SA RE GA MA classical singing TARANNUM at the end. Manna Dey sang it very skillfully. I fully enjoyed it. It reminded me, that in college days, my friend informed me, that this part is missing even in HMV records/cassettes. Sometimes, we were lucky enough to listen to it, if the full song is played at radio. The audience was keep demanding songs from movie Padosan and Kabuliwala. 19 Next song was from movie "Mera Naam Joker". Be careful, while walking and look at front, back, left, right, up and down. This song also has some philosophy. It compare the life with circus show last for three hours. First hour is childhood, second your and third old age. After that nothing. Empty chair, empty tent, nothing is yours, nothing is mine. 20. A patrotic song from "Kabuliwala"
country. Manna Dey told about this song in an interview: "Bimalda (director Bimal Roy) explained the scene to me. Kabuliwala r eturns home late in the night to his one-room tenement and is nostalgic about his young daughter away in Kabul. I was asked to render it softly, keeping in mind that Kabuliwala wouldn't like to disturb the other occupants of the tenement. Sound recordist Sharma wanted me to sing a bit louder. But Bimalda put his foot down. After the recording, Sharma hugged me and said the song was superb." Arvind started with introduction of his employer. SLOKA started in 2004. Now about 30 people are working with SLOKA. At present SLOKA provides solution for Fixed WiMAX (IEEE 80.16d). They have roadmap for LTE & Mobile WiMAX (IEEE 80.16e) as well. Arvind started with some background of various wireless system, generations, architecture and protocol stacks. This slide I liked that shows various generations of wireless system evolution with both stream 3GPP and 3GPP2. After this background, we discussed the main topics and he listed out possible security threats, security goals and security context. Generally standards are written more for mobile handset. For network equipment side, many things left open. AKA stands for Authentication & Key Agreement. We had interesting discussion on challenges to implement number portability. For Mobile originating call, it is easy. The new mobile operator will issue a new SIM card so new IMSI. He will map in his database this new IMSI number with your old mobile number (MSISDN). However how to terminate the call at mobile, after the subscriber has moved to different service provider and he is holding mobile number as per old service provider numbring scheme. So the GT (Global Translation) , which is used to route SS7 packets towards destination network, should be changed. We also discussed about IMEI based blocking of phone. At India, we do not have centralized EIR database. The new low price mobile has IMEI values are all zeros. He explained security in GSM, with AKA and LAU procedure. The SIM card have A3, A8 and A5 algorithm. A3 and A8 are used for authentication, during LAU and incoming call. A5 is used for encrypting the data/voice, if it is enable. These algorithms are on SIM card. SIM card do not have CPU. It is implemented with hardware logic. They are proprietary algorithms. Standard recommends COMP128 so in early days everyone implemented that only. In 1998, some document got leaked. The biggest flow about this approach is Ki, which never changes. Audience suggested, can we read Ki if we have memory dump of the SIM card. Yes, we can, but the challenge is to identify the Ki in the memory dump. Unlike Ki, Kc frequently changed. Kc is just 54 bits/bytes so comparatively easy to derive, by reverse and A8. Yes for A3 and A8, ECC is best algorithm, theoretically but difficult to implement in SIM card. Nowadays COMP128-2 and COMP128-3 are used. TMSI allocation and AKA both are independent procedure, but may happen together, generally at the time of LAU. He listed these three approaches to identify Kc, and crack encryption algoritham. 3. Side channels IBM standard with RF monitoring. View more presentations from ACMBangalore. Next discussion about security aspects for 3G UMTS network, and how it is different from GSM. Here we have two way authentication. Even UE also authenticate network. So in stead of authentication triplet now we have authentication quintet. He explained RRC security procedure. We have also START, THRESHOLD and counter check mechanism to prevent man in the middle attack. It uses for session lifetime. At UMTS 3G network, we have CK for encryption (Kc in GSM) and additional key IK for integrity of the data. GSM uses CKSN, while UMTS uses KS1 from SIM card. In UMTS the data flow is suspended and resumed before changing key. There are various inputs to f8 algorithms like Ck, count-C, Bearer direction. Output is keystrem block. FRESH, direction, counter-1, message and IK are input for f9 algorithm to generate MAX-1. Here message is Radio bearer ID, RRC Sequence number and signaling content. USIM and AuC are involved. CK, IK, XRES, MACA-A etc used. UMTS has Radio Bearer, that is similar to service flow in WiMax. Two types of Radio bearers Data and Signaling. Yes, Arvind added that multiparties are involved to secure the network. And the operator has to take care of possible security threat from contractor. He added that VISA wanted to implement some online transaction solution in SIM card. So your SIM card (so your mobile) act as credit/debit card. However, VISA and mobile operators both parties were not comfortable to share some secret details about security implementation. In the field of security, the publicly published algorithms are more secured. As all have tried to crack it and so made it more robust. Arvind discussed some interesting scenarios for UMTS about backward compatibility with GSM. Our mobile handset, our SIM card and the network, all the three elements can be either 2G GSM or 3G UMTS. 2G GSM system uses KC, while UMTS sues CK and IK both. 3G UMTS SIM card is USIM, 2G mobile is MS and 3G mobile is UE. conversion is standard algorithm. The attachment is between USIM and AuC. If USIM with 2G MS joined to 2G GSM network. USIM has CK, IK that should be converted to KC and XRES to SRES. This implementation is at USIM, so not standardized. But if USIM with UE joined to GSM network then conversion happened at UE. It is from CK+IK to KC, so need to standardized. At last, Arivind gave some algorithmic background, like ciphering type, data integrity and encryption some basic popular algorithm. Fro UMTS 3G, the f8 and f9 algorithams are based on KASUMI. KASUMI means mist in Japanese. It is block cipher. MISTY algorithm for block cipher, by Mitsubashi, is in public domain. And as name suggest, KASUMI is based on MISTY. A5, A3, GRE3 algorithams are based on KASUMI. One can always have two choices, to implement these algorithm. Hardware and software. For network side, it does not matter much. However for mobile handset side, this choice has much impact. The software implementation we can always optimize and fine tune as per underlying hardware. Yes, in one of the project, I further optimized Diffie-Hellman key exchange algorithm for 32 bits and 64 bits processor. We discussed about end-to-end security. Even today, also our landline phones are not secure. Anyone, can tap the line and listen the conversation. Yes, we can find some device to encrypt/decrypt voice with Internet help. Since it is proprietary solution, both party has to use these product. For GSM in India, I am very skeptic about RF level encryption. Even microwave link between BTS to BSC are not protected. I was wondering, how one can tap microwave link, as it is line of sight. I was curious to know with GTP-C, T-PDU transfer during inter SGSN handoff is implemented or not. We talked about 3G, since BSNL had recently launched it. generally 3G phones are high end phone. However in the like India we may have low end 3G phone, after 3G roll out here. How does it look? 3G means it needs at least browser, then how it will be low end! Let's wait. He concluded the session with list of 3GPP standard as reference. Overall it was very good session. Arvind involved the audience in the talk and handled the question-answers very nicely. Even some were less relevant questions. I met some of my ex-colleagues from Lucent (now Alcatel-Lucent). I am thankful to the speaker Arvind, ACM and my friend Jayesh, who informed about this session on chatting. Sometime back, Guruji (Sri Sri Ravi Shankarji) informed us that “1st May a German nuclear scientist named Hans-Peter Dürr will visit the Art of Living Ashram, Bangalore. He will talk about physics, but its content will be similar to our Veda.” Prof. Dr. Hans-Peter Dürr is expert at and quantum physics, elementary particlesgravitation, epistemology, and philosophy. He has also advocated responsible scientific and energy policies. He is the founder of the Global Challenges Network and a world-renowned physicist. He is also a recipient of the Right Livelihood Award, also known as the Alternative Nobel Prize. So I was at Vishalakshi Mantap, Art of Living International Centre, Bangalore on 1st May along with my friends. The topic was “Science and Spirituality”. Dr. Duerr is 80+ years old. He was 'decorated' with Indian traditional dress of Kurta Paijama. He warned us that we may not understand most of the thing and he kept us engaged to his talk with his sense of humor. He started with : We are still living 19th century midset about technology and shaping 21st century. He shared his experience that many people use cellphone, but they are not aware, how it works! Some elctromagnetic waves travels in ether. But ether does not exist! Nothingness exist. Matter and material science is his favorite subject. He spent almost 50 years to do research on this topic and concluded that matter does not exist !!!. The conclusion is not because his failure attempt, but it is truth. Yes, on 18th Jan 2009, we had similar discussion with Guruji. Guruji confirmed “Aisa hi hai” (It is like that only) Here nothing exist. We can touch, we can feel the matter, but actually it does not exist! 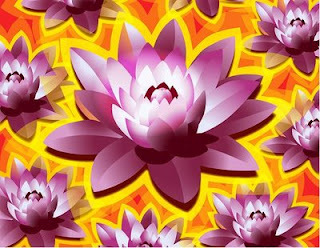 He suggested to refer Lotus-sutra and Heart-Sutra by Buddhism. Watch this video for details. Dr. Duerr, being scientist evaluate, judge, measure repetitively before conclude something. We normal people, assume and guess. However, he confessed that after all these efforts, he gained some knowledge and reached to our (audience’s) level. What a humbleness! The science and scientist are not different. The creator and its creation are inseperable. The observer and object are not different. The object and subject both are one only. The science break that oneness. So an object study a subject! They are same. Life scientist has nothing do with life. If nothing exist then “What is this?” question becomes irrelevant. We need to think in different way. In fact, we experience much more than what we can grasp. He quoted some two fundamental lows about likely and unlikely events, that seems to me similar to Murphy’s law. With few diagrams he explains that faith, wisdom etc belong to one circle. Logic, analysis, science and reasoning is connecting one, the middle circle and the end result is the scientific knowledge and theory, the third circle. Thus, the science only helps us to derive the knowledge from the eternal wisdom. He showed those famous photographs about illusions ‘an old lady and young girl’ in a same picture. Everyone has its own world. We believe that reality is world. In fact world is not reality it is potentiality. From that potentiality, the energy and matter manifest. We do not look any scene as just with eyes and brain. Our mind puts its own color to it. It is like software. Software is ultimately 0s and 1s only. Still all softwares looks different. So since childhood if we learnt this is photo of an old lady, we tell the same to next generation. Thus, customs are built. He nicely explain the limitation of science with example of fisherman and its net. He also discussed about the trees, which converts Carbon Dioxide to Oxygen. It cost trillions of dollars, to mankind, while the nature is doing it free of cost for us. So do not believe scintist and economist. As they are limited by what they can observe and measure. (Once Guruji told, what we can measure is MAAYAA = illusion....something like that.) He made the session interactive with thought provoking questions like, what is the color of circle? The color and thickness of circle depends on the pen that one uses. The circle has no color, no thickness. As I understood, he was trying to explain that different religions are like color and thickness but the ultimate truth is like circle. The recent Tamil movie “Dasavatharam” has dialogue about butterfly effect. If a butterfly flaps its wing then it can bring typhoon at Amazon forest. He explained the logic. The whole system is such an unstable state that somehow if one water molecule got momentum then it impact many other similar molecules in atmosphere and it causes the typhoon. He continued further that, If a pen standing upside down, then it can fall to any direction even by slightest force. Which direction it will fall? It has highest point of instability. He reminded us the Newton’s law of gravitational force. It exist between all pairs of two objects in this universe. So all remaining objects will try to attract the pen, including himself, the audience and some car passing by. The pen will be as much sensitive as it is at the center. Yes the contentedness brings so much sensitivity in us also, for rest of the world. You are present here also and at the same time in this 17 billion light years big universe as well. (I guess, this is enlightenment. You may like to refer my article about ‘Concave Mirror’, with similar logic. ) So one should not be scared of highest point of instability. That is life. He explained nicely some science concept with example of pendulum and series of several pendulum. The imbalance to balance is life. There is difference between living and non-living. He also showed some pictures about atom structures. The matter is nothing but energy waves. The three has magic property to remain imbalance. Guruji had already informed us, that he will tell this statement. And Guruji also added to it, that probably that is the reason that we have 3 DOSHAs (distortions) (VAAT, PITT and KAPH) and 3 GUNAs (Qualities) (Satva, Rajas and Tamas). Dr. Duerr ended, "Our both legs are different, and we canno remain stable on one leg. However when we walk, both legs give us stability dynamically. Same way, in this world everybody are important and we should respect the diversity and get cooperation from different individuals." Yes, I was not fully comfortable with his German English pronunciations. We noticed that the speaker was so involved in the talk, that sometimes, he faced difficulty to recollect the words, to convey his message. Whatever I could hear, listen to and understand, it was excellent. I lost myself in his speech. After a long time, I attended such a nice speech. I experienced that yes, science and spirituality/religion are really meeting at one place. Whatever (1) a devotee can gain with faith, (2) a Vedanti person can get knowledge of Advaita the same knowledge (3) a scientist gain with his research. P.S. Have you noticed, I added a list of upcoming articles at right hand side bar of this blog?